Download the completed Quartz Composer FX and VDMX project file for this tutorial. Among the video analysis tools available within Quartz Composer is the “Detector” object which examines an input video signal and outputs the size and coordinates of any located faces within the frame. This control information can then be used for automatic real-time image cropping from live camera feeds, adjusting the parameters of FX while VJing at a concert, or creating interactive art installations that react to the location of people within a space. For this demonstration we've made two basic QC compositions using this simple detection object that can be loaded into VDMX to perform basic face capture and replacement FX that can be connected in a variety of ways. You can also use these example patches as starting points for your own patches that perform more complex behaviors like tracking multiple faces within a single frame or publishing additional control information. The first composition is designed to be loaded as a QC based data-source plugin and provides both a cropped image output of a detected face and the raw values for modifying the levels of any controls within VDMX, such as the size and position of a layer. 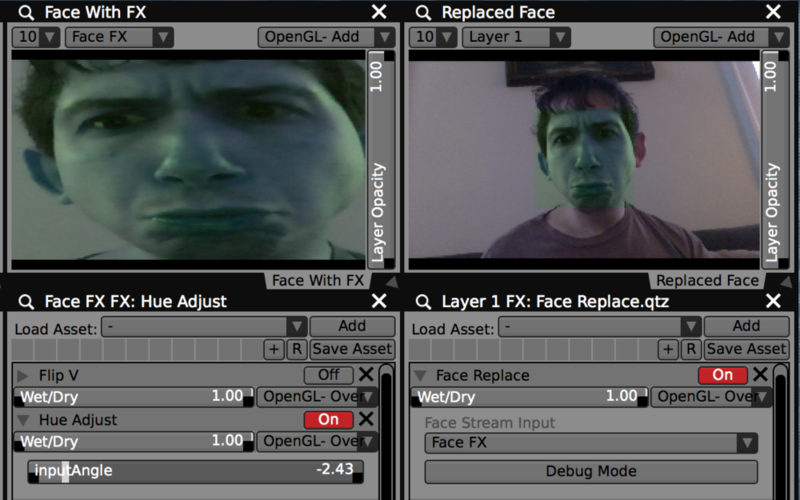 Our second example patch is an FX that can be applied to any layer to automatically position an overlay video feed on top of the face located in the input. The overlay provided can be from the cropped output from our plugin, or any other available video source. After watching this, try adding a sound reactive element to this setup or read more about how to extend VDMX with your own Quartz Composer based FX and data-source generator plugins. 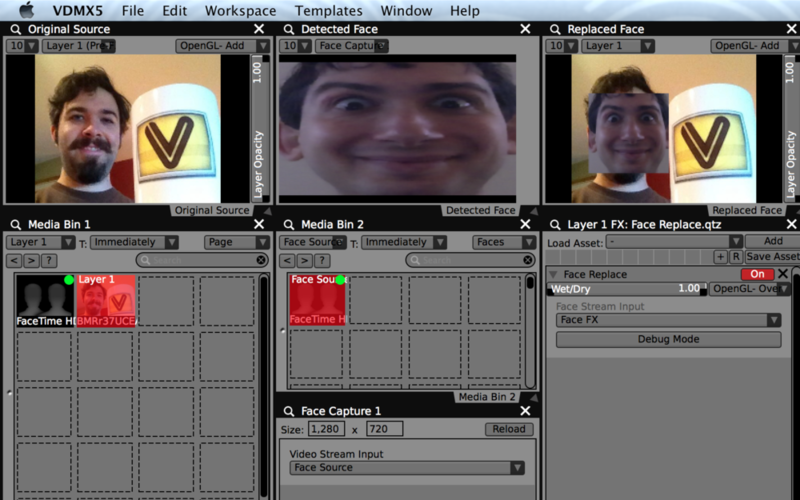 The example “Face Capture” plugin finds a face and crops it out from its original frame for use in VDMX. 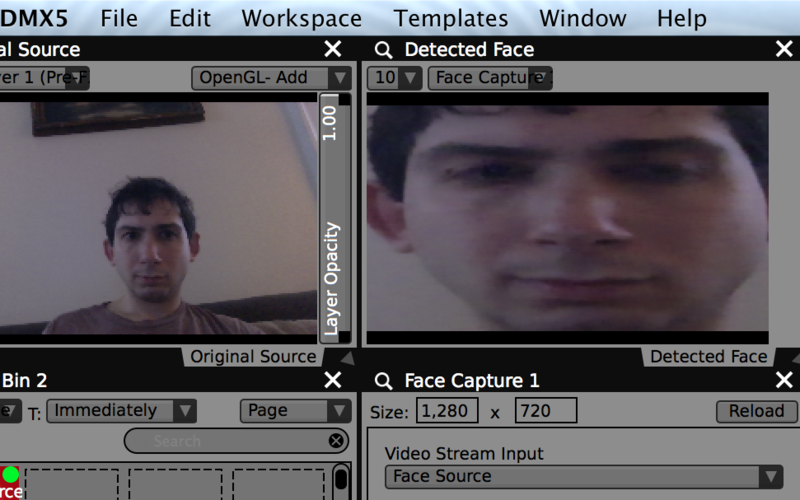 Use the “Face Replacer” FX to replace a detected face with an alternate video stream. The raw center, width, and height values are also published as data-sources to control other QC patches. Use either live camera feeds and prerecorded footage for the capture or replacement video layers. The “Detector” object can also find the positions of the eyes and mouth. 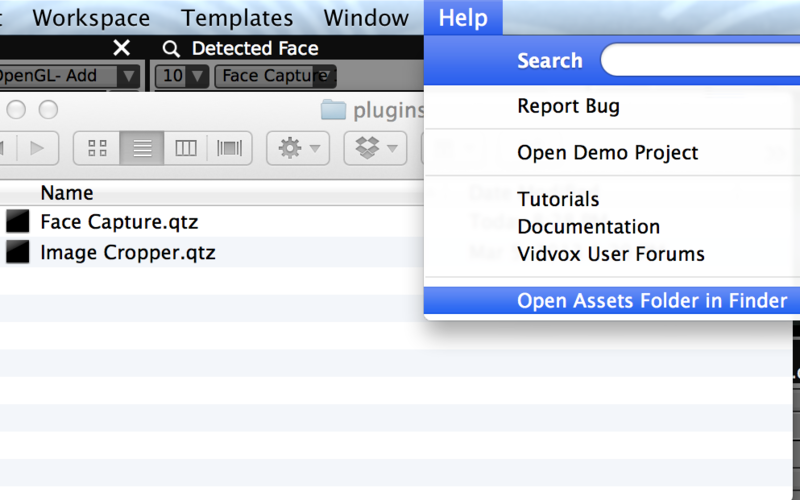 Quickly open the VDMX Assets folder from the Help menu to reveal the plugins and qcFX folders.